Some of the important headlines in our today's Current Affairs Updates - 18th April 2018 includes App-based cab aggregator Ola plans to introduce 10,000 e-rickshaws and electric auto rickshaws in India, UK joins International Solar Alliance, Bengaluru being the highest paying city and other similar news. These are all important for the upcoming government examinations like Bank ,IBPS PO, IBPS CLERK, SSC CGL, SSC CHSL and other similar examinations. We hope aspirants would find this article really helpful. 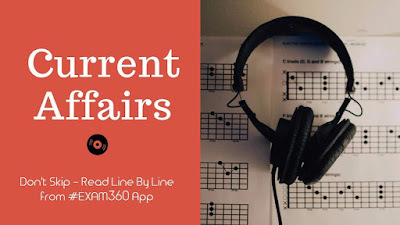 Other than these we also include Daily Current Affairs Quiz for you to practise on a regular basis. The World Federation of Hemophilia will focus on the importance of sharing knowledge. The bleeding disorders community is filled with the first-hand knowledge and experience needed to help increase awareness, as well as to improve access to care and treatment. Shares of private lender Kotak Mahindra Bank Ltd on Monday beat India’s largest lender State Bank of India (SBI) for the first time to become the second most valued bank in the country. Kolkata-based Bandhan Bank Ltd became one of the top 50 most valuable publicly traded firms in India. On Thursday, the market capitalization of Bandhan Bank was at Rs64,000 crore, claiming 50th rank, according to BSE data. The garden city of Bengaluru, which topped the list of salary trends in 2017, continues to lead the pack as the highest paying city in the country, with an average annual cost to company (CTC) for talent across all levels and functions standing at about Rs 11 lakh, according to Randstad Insights, the research and analysis division of Randstad India. BJP leader Subramanian Swamy today backed RSS Sarsanghchalak Mohan Bhagwat’s suggestion on Air India rights. App-based cab aggregator Ola plans to introduce 10,000 e-rickshaws and electric autorickshaws in India in the next 12 months, the company said in a statement. The ride-hailing company is in talks with state governments, OEM partners and electronic vehicle innovators to speed up the introduction of EVs in India. The United Kingdom on Monday joined the India-led International Solar Alliance (ISA) ahead of Prime Minister Narendra Modi’s four-day visit to Britain. At an event held at the London Stock Exchange as part of the Commonwealth Heads of Government Meeting 2018 (CHOGM), Britain formally announced its membership of the alliance, which aims to raise $1 trillion of private and public finance to provide affordable and sustainable energy for all by 2030. A giant asteroid gave Earth a surprise close shave this week, flying by at a distance of 1,92,000 kilometres, just a day after astronomers discovered the object, scientists say. A Loan Agreement for IBRD loan of USD 48 million for the Meghalaya Community - Led Landscapes Management Project (MCLLMP) was signed with the World Bank. Kerala will host the India Skills Kerala 2018 – in Kochi from April 28 to 30, as part of the World Skills India 2018. The event is aimed at identifying and training talents to get medals at the World Skills Competition Kazan 2019. This year's Pulitzer Prize winners include journalists who helped launch a movement, a former criminal defense attorney and a hip-hop star.